Whenever I eat squash with a meal, I always save it for last. To me, it’s like dessert and I prefer to savor each and every bite. 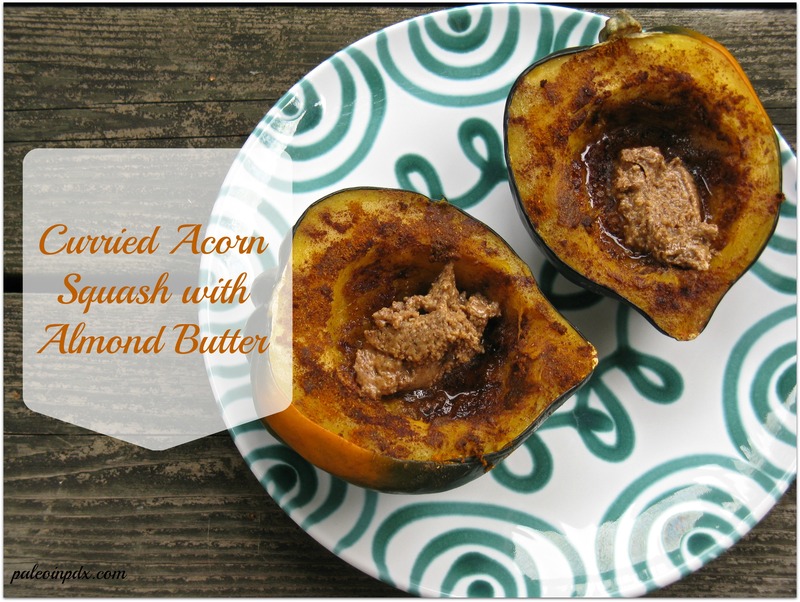 This curried acorn squash with almond butter is no exception. The almond butter gets all melty and gooey, and it’s like heaven with the squash, butter and spices. Now, it’s really like dessert! I usually like to keep it simple with squash and just add butter and sea salt, but sometimes you just gotta go be extra. This rendition is all about extra! Preheat oven to 350 degrees. Place squash halves flesh side down in a baking pan with about 1/4 inch of water. Place in preheated oven and bake for 40 minutes. After 40 minutes, remove from oven and flip squash over, so the flesh side is up. Spread 1 Tbsp of grass-fed butter on each half and allow to melt into the cavity (I like to poke some slits with the knife in the cavity, so the butter seeps inside). Sprinkle with sea salt and cinnamon to taste. Then, sprinkle 1/2 tsp of curry powder over each half. Spread spices around with a knife if need be. Place back in the oven flesh side up and bake for another 20 minutes or until tender. Once done, serve with 1 Tbsp of almond butter in each half. It’s pretty heavenly! If you can’t find acorn squash, just use whatever you can find. You can always mix everything up like a mash if you use a squash that wouldn’t be eaten out of the shell. YUMM! I actually have almond butter in fridge….. Absolutely! Coconut butter will be thicker and creamier with a different texture, but would be delicious. You can also use coconut oil and spread it on like butter.